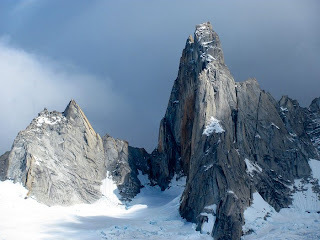 Mountain Hiking Holidays Blog: "De la Esse" and "Saint Exupery"
Here at two of the peaks of the Fitzroy massif. On the left is the peak known as "de la Esse." On the right is the tower, or needle ("aguja" in Spanish), of "Saint Exupery" named after the French flyer and author of "The Little Prince."